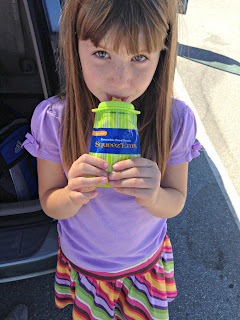 We have used disposable food pouches with our kids ever since my daughter was little. They have always been so convenient for a meal on the go. There is basically no mess, and they don’t need to be refrigerated. The problems my family has had with them has been that they are relatively expensive (even on sale) and they create a lot of waste from throwing them out. 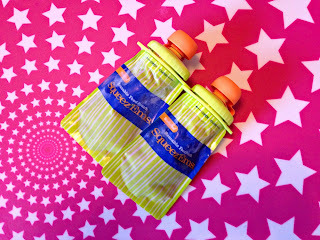 When I had the chance to review some of the Booginhead Squeez’Ems Reusable Pouches I was excited. 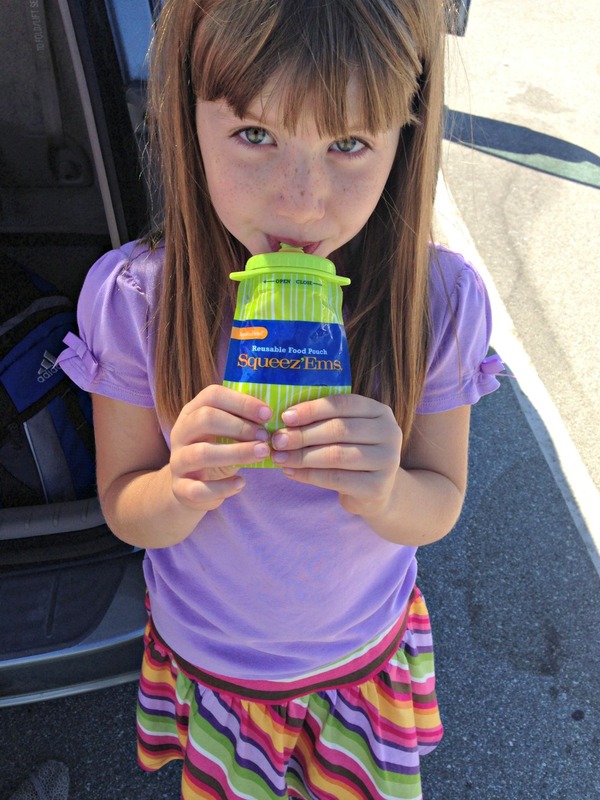 With a 7 year old, 3 year old, and a baby on the way a good reusable pouch would be very valuable for our family. Booginhead sent me out a few pouches to review and so I tested them with a variety of foods. I first tried them with applesauce. The first thing I noticed was that they were easy to fill. 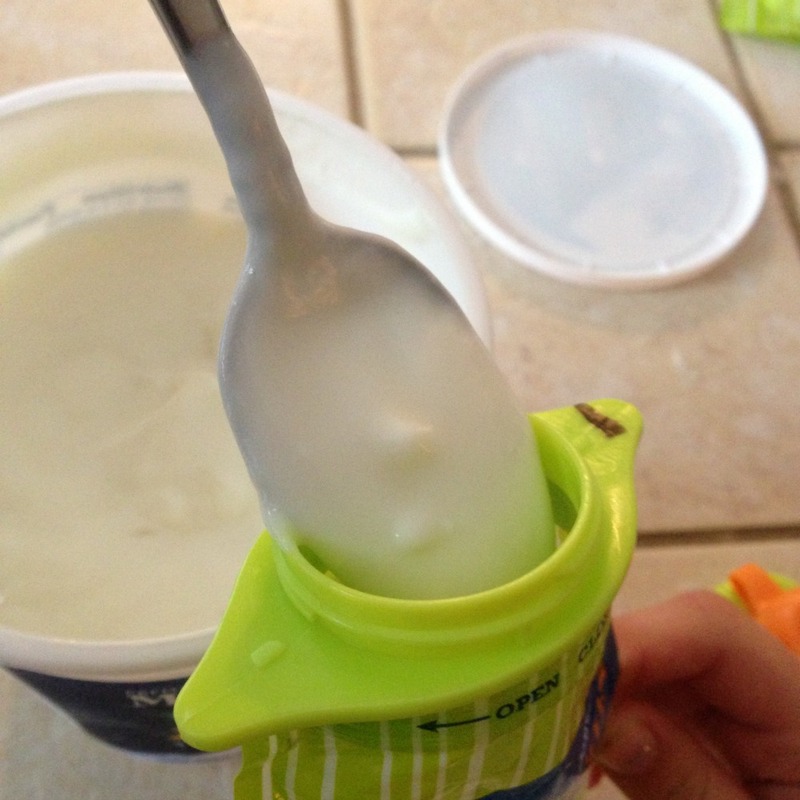 A regular sized spoon will fit all the way into the top of the pouch so you won’t make a mess. I was happy with the amount I was able to put in. Another nice thing about refillable pouches is that you can buy a large jar of food to fill them and it costs much less and produces little waste. My kids sucked the applesauce down fast without many problems. The only small issue was that because of the design of the lid, there was always a small spoonful of food left at the top that couldn't be sucked out. The next day I washed them again and filled them with my wife’s healthy fruit smoothies that the whole family loves. We froze those because I wanted to see how the pouches did in the freezer. We took them out the next day and I gave one to my 3-year-old son while also taking one for myself. The pouch worked well once it thawed a bit. The last test was a bit tougher. We filled them with yogurt and took them to the local amusement park. The kids ate the yogurt for lunch and the pouches spent the rest of the day in a cooler. I was interested to see how they would clean up after that. The Squeez’Ems pouches cleaned up fine in the dishwasher after every use, even after a day at the amusement park. The one problem I found was that after a few runs through the dishwasher it was harder to get the lid lined up correctly on the pouch. It still screwed down and didn’t leak but it was a little frustrating to get started. This was true for all the pouches I was given. My suggestion would be to hand wash them to make sure you don’t run into this problem. Also, over time there is the chance of buildup and I don’t really trust my dishwasher to get it all so I would use a bottlebrush to clean them. Overall, I like the idea of the Squeez’Ems refillable pouches. Only time will tell if the durability will hold up, but so far the only real issue I have had is with the lids. One thing to keep in mind is that your food will need to be chilled, unlike disposable pouches. The only other suggestion I would make would be to buy a number of them and fill them all at the same time. It can be kind of tedious to fill one or two just for the day. However, if you use them enough they will most likely pay for themselves over time. You can order a two-pack online from booginhead.com for $7.99. Disclosure: Booginhead sent me this product to review. I have received no other compensation for this post and the opinions I’m expressing here are solely my own.